Once known as the “shooting box”, the Roundhouse which nestles in the Glen halfway down the sylvan slopes of Signal Hill was Lord Charles Somerset’s hunting lodge. Here Somerset potted leopard, antelope and even lion. A regular guest was Dr James Miranda Barry, upon whose demise many will know Barry turned out to be one Margaret Bulkley – a rare case of lamb dressed as mutton. The Roundhouse first became a restaurant-tearoom in the 1840s. I recall it was a ramshackle backpackers’ in the 1990s. The restaurant opened under its current proprietors in mid-2008. They have preserved something of the lodge about it, with its woodwork, riempie chairs, ceiling fans and brass paraffin lamps. There are plans, together with SANParks, to open an eco-tourist hotel in two years time. It is commendable that the owners haven’t tried to airbrush the history. A closer look at the window panes and you can read the names of the lovers who etched their betrothal in the glass with diamond rings. Now that’s a sign of a classy establishment. From the courteous welcome you receive in the parking lot right through to getting the check at the end of the meal, the staff are friendly and efficient. When it opened, I remember some restaurateurs grumbling that their best staff were being headhunted by the new Roundhouse. Sprawling below the main building are numerous tables on the lawns and decks. During the day, the al fresco restaurant functions as the Rumbullion, serving tapas, charcuterie, cheese and salads. They also do cheese burgers (R85). Largely sheltered from the Peninsula’s summer winds, it looks out through the pine trees to Camps Bay. This is one of the best spots in Cape Town for a sundowner. While reclining in windless luxury, one can actually see the squalls out at sea. Based on just one lunch experience, I recommend dinner. My bouillabaisse with squid, chewy whelk (I think), and a medallion of white fish, was too tomatoey, brown in colour, and oily to deserve its appellation. My dining partner, Munchkin, loves this place, and relishes the outsized starter of large marrow bones served with onion marmalade toast. Chef PJ (Peter John) Vadas has a first-class CV having worked for several years under Gordon Ramsay. He has a penchant for offal. The pork belly was a sort of cassoulet really, trimmed of thick fat and without crackling. It comes with a generous portion of haricot beans, a tomato-based ‘gravy’, soft mash, yellow pattipans and sweetpeas. The kingklip was a niggardly portion with two baby potatoes outweighing the fish, and presented most oddly on the plate – as if the chef was dealing with nouvelle cuisine. I have had dinner here several times and these have been far better. The four course menu is R395, with wine R595. Considering there is hardly a wine worth having for under R200 a bottle on their list, you might as well go for the pairing. The complimenting wines the sommelier chooses are good quality. For starters, two Saldanha Bay oysters with apple jelly, pork crackling, and a soupcon of cucumber and lime soup was pleasingly reinforced with one of our most estimable sauvignon blancs, the Springfield “life from stone” 2008. Buffalo Ridge, a farm just north of Wellington where they have actual buffalo, provides the ricotta for the cannelloni with pickled beets, pine nuts and balsamic jelly. I enjoy this restaurant’s habit of disclosing the source of their produce. A zesty Méthode Cap Classique Ross Gouwer pinot noir brut rose did more than just colour-match the beetroots. The red wine risotto with kingklip confit and grana padana (a hard Italian cheese) from Kleinrivier was also judiciously paired – with a rare single cultivar viognier wine from Lismore Estate in Greyton. The West Coast crayfish was precisely poached (referring to its style of cooking not its acquisition) and served with smoked pork trotter (“not a big pig foot on the plate”, I was assured when ordering) and broad bean salad. Graham Beck’s expensive premium Bowed Head chenin blanc was a safe but apposite choice. Roasted quail drumstick with quail confit and white asparagus, one of which had a green tip, was overpowered by the sherry jus. Even the Galpin Peak 2007 Hannibal blend couldn’t stand up to this jus. A similar problem of just too much intense flavor in the artichoke and basil emulsion bedevils the braised lamb tongues (Vadas’s predilection for offal again) with fluffy gnocchi. It’s hard enough finding a wine that goes with artichoke. The berried Raats Family cabernet franc almost succeeded. The surprise was a pre-dessert shot glass of tiramisu. The best I’ve had. I can recommend for dessert the Swiss Felchlin chocolate fondant with choc chip and honey ginger ice cream accompanied by a glass of full cream sherry. The giant tray of artisanal South African cheeses and preserves is quite spectacular when it arrives. You make your choice using coloured pins. The kitchen will prepare the plate. A glass of Alleverloren Port completes a near perfect evening. After one of these dinners you’d best not attempt to negotiate the bendy road out of the Glen. Call a cab, marry a teetotaler, or make use of one of the many driving services that are springing up. Let’s have a safe 2011. 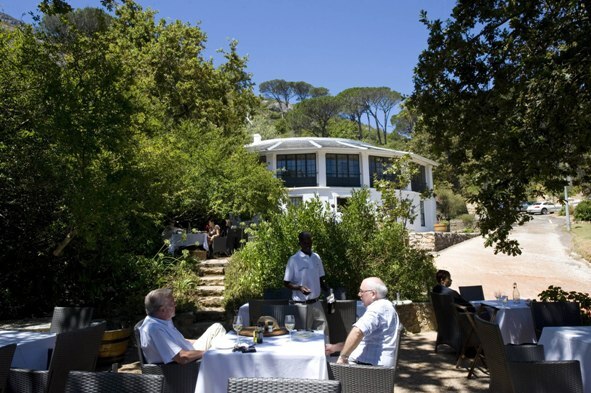 The Roundhouse Restaurant, The Glen, Kloof Road, Camps Bay, Cape Town. Call 021-438 4347.